Rated R for disturbing violent content, and language throughout. Oren Moverman’s “The Dinner” is an incredibly frustrating movie, almost purposefully so. It is a film about people who say things like “We’re gonna talk tonight … put it all on the table,” and then never do. They’re constantly avoiding not just the truth but basic human interaction. They’re always interrupting each other or leaving the conversation just as it’s getting going. And Moverman attempts to mimic this feeling of constant interruption in his filmmaking decisions, cutting back and forth in time, always keeping his camera moving, and trying to add strange tension to a story that lacks it. The result is a film that’s often infuriating, one that works in fits and starts but ultimately fails. 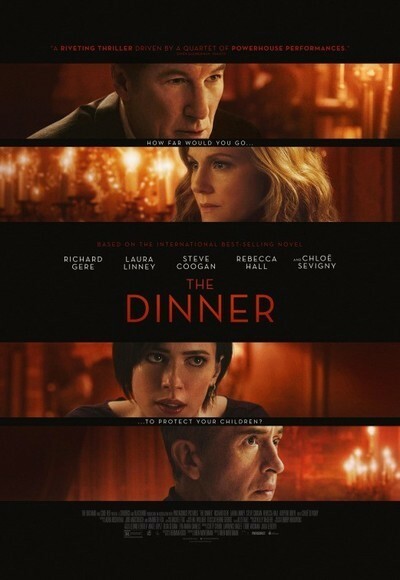 Paul Lohman (Steve Coogan) and his wife Claire (Laura Linney) are going to dinner at a remarkably fancy restaurant with Paul’s relatively-estranged brother Stan (Richard Gere), a high-powered politician, and his wife Katelyn (Rebecca Hall). They’re getting together to discuss a horrific incident involving their children, which we see in flashes back in time. Their affluenza-stricken progeny did something horrible to a homeless woman sheltering in an ATM room, and it was caught on a security tape. Not only could their kids go to jail, but Stan’s political career could be derailed. As more and more lavish courses come their way (shepherded by an effective Michael Chernus as a nervous maître d’), the couples bicker, fight, and reveal the depths of their personal problems. It has echoes of Polanski’s “Carnage” in the way Overman attempts to analyze how our children’s behavior can often become a mirror of our own issues, but it's all mysterious back story revelations instead of anything insightful about who these people are today or where they're going. To say that the flow of “The Dinner” is clunky would be an understatement. It is purposefully designed to push against traditional cinematic rhythms. However, formal experimentation can easily give way to incoherent nonsense, and Moverman falls into the second category far too often here. There’s a centerpiece at Gettysburg, another flashback to when Paul and Stan visited there, that feels interminable. It’s the kind of bizarre sequence that forces you to question what you’re watching and why—which could be Moverman’s intent, or he could just have been too opaque when it came to his writing. Is Paul going crazy? Has he always been crazy? There’s a motif of living in the past—Paul is a history teacher—but it’s woefully underdeveloped. Paul says things like “History is either a lie or a bore,” which sounds much deeper than it actually is. History can’t compete with the now. Yeah, what else ya got? And if that's the case, why is the "now" in this film so secondary? There are moments in “The Dinner” when the sheer talent of the cast pushes through the formal nonsense. Moverman’s greatest asset has always been his work with actors, which is why performances from the films “The Messenger” and “Time Out of Mind” have been cited on Best of the Year lists. There’s a great four-person scene just over an hour in when the cast finally gets to the meat of the matter and you can see a glimpse of the actor-centric film that this could have been. It feels like Moverman was worried that the source material, a book by Herman Koch that’s already been adapted three times, would be too stagey, but he pushes the meter way too far in the other direction, overcompensating and overshadowing the best assets of his work. Having said that, Linney still gets some killer moments in the final act. She somehow always finds a way to do so. Coogan makes out less successfully, but it’s in part because this character is such a mess, bouncing in and out of narration and woefully inconsistent in key ways. “The Dinner” should be a scabrous satire of awful kids with more awful parents. Koch notoriously declined to attend the afterparty following the Berlin premiere because he was so turned off by what he saw as moralizing in this film version. I’m not sure I see that, but I’m not sure I see anything. It’s as if Moverman couldn’t commit to the stinging, harsh take on affluence that this needed to work, and so he fell back on filmmaking tricks instead. He’s trying to keep himself entertained, playing with structure instead of finding a reason to do so. The form only loosely feels like it’s trying to comment on or enhance the action here. Most of the time, it’s a meal that just doesn’t leave you feeling full in any way.